Excellence is the Butler Advantage! Mike took over ownership of Butler Home Improvement and Sunspace of Greater St. Louis in October 2018. He came to the company with a wealth of construction knowledge gained from running his own home construction and excavating companies for 25 years. Mike’s reputation as a top-notch contractor came from delivering well-built homes at affordable prices to hundreds of homeowners. His standard of thorough procedures with quick turnaround has cemented his status as reliable and trustworthy. When I bought Butler, I had been looking for a new opportunity that would allow me to stay close to my roots, and improve my community. Butler seemed the perfect fit – big enough to impact our area, but small enough to get to know my customers. Sunspace allows us to offer our customer’s a superior product with a multitude of options. Several family members have stepped up to help me re-launch Butler, most notably, my son, Michael, who has come on board as a project manager. Tony Galloway, Butler’s operations manager, is also as a long-time friend. With our combined skills, we are a formidable team. We hope to grow this business by bringing you great products and outstanding workmanship within your budget. Let us show you how it’s done! Changing your community for 20 years! 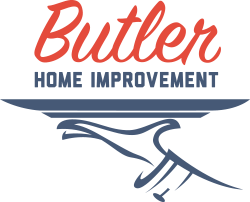 Butler Home Improvement has been providing quality home improvement services to the Metro East and St. Louis area since 1996. Butler has made great changes in its progression. One of our core values remains the same – Deliver superior customer service, always! We have been recognized in the industry for our achievements and commitments. We are fortunate enough to have the awards to back this up. Our team wants to earn your business. We will show up when we say we will, build your trust, deliver quality work, and always strive to do the right thing. We are a locally owned and operated business looking to earn your trust. We want to be your home adviser and become a company that you can depend on. We look forward to hearing from you and helping your dreams come true.